Could it be true? The temperature today was 19oC, my friends were tweeting to me that they had spotted Brimestone's, Comma's and Small Tortiseshell's and I was stuck in smokey noisey old London. A barren place for wildlife compared to Suffolk. However, with all this beautiful weather about, I wasn't to be outdone and thought that now would be a good idea to roll out my secret weapon to see how it fares, and as soon as I got home I set to work to get the weapon ready. After about an hour it was more or less, not finished exactly, more 'ready for a trial run' if anything. I laid out a white sheet bought for me by the wifey from a charity shop, stood some egg trays up like upside down 'v's and placed my weapon in the middle. Can you guess what it is yet? 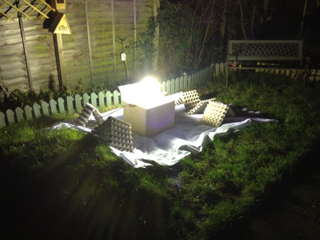 It was my moth trap that I have spent some of the winter months building. The first thing I noticed was that I had measured the amount of cable wrong, I need more, about another 10 meters more. So I wasn't going to be able to leave it out over night as I had to connect it with an extension lead, which wasn't weather proof. So did it work? 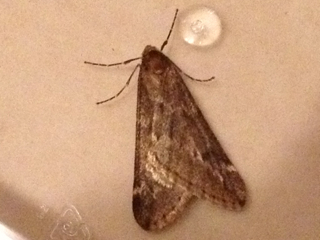 Yes it did and I am happy to report that although it is only February, I got 3 moths Yay! 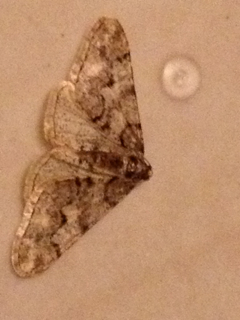 The first was a March Moth which was the only one I actually found in the trap, strangely. 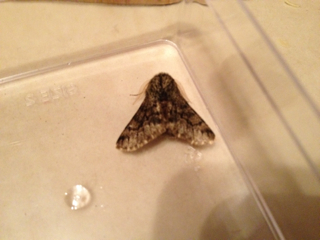 Then a little while later I found the Spring Usher on the outside side of the box and just as I had packed every thing away, I went back to collect the sheet to find that the Small Brindled Beauty had landed on it. Great, hat-trick. So, after reading all my friends 'tweets' on Twitter, I can hold my head up high and stand proud, they might of got 3 butterflies, but I got 3 moths and for a bonus, my moth trap works! Joy. And one more to add to the list as I packed away tonight, I took a quick look in the pond to find a rather emaciated male toad awaiting for the females to join him. So Bufo bufo joins the list at No:85 and is also the first amphibian on the list. You can find me on twitter as @SuffolkNature, please follow and spread the word if you like this blog and I always look forward to reading your positive comments, thank you.